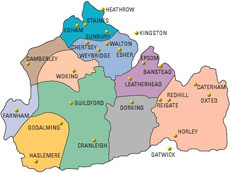 The Surrey Hills Roofing site is a UK based website and takes reasonable care to comply with requirements of the UK Data Protection Act 1998 with regard to the personal information you supply on this site. A cookie is a small file which asks permission to be placed on your computer's hard drive. Once you agree, Surrey Hills Roofing may collect identifying information (not personal information such as your email address) using cookies. Cookies are required as part of this website's operation, and we use traffic log cookies to identify which pages are being used. Overall, cookies help us provide you with a better website by enabling us to monitor which pages you find useful and which you do not. A cookie in no way gives us access to your computer or any information about you, other than the data you choose to share with us. Surrey Hills Roofing will use the data you supply to answer an enquiry or to administer an ongoing commercial relationship. We will also use your data to tell you about changes to the site, new information, or products and services offered by Surrey Hills Roofing if you opt-in to receive marketing information. You can choose not to receive this information by sending a blank email to info@surreyhillsroofing.co.uk with the subject "No more emails".